I have a secret that I would like to share, I'm a kitchen gadget geek! I love a good home shopping channel gadget, nicer dicers, egg slicers, juicers, steamers, bakers boilers I've had (have) them all. But my latest gadget is an egg boiler! 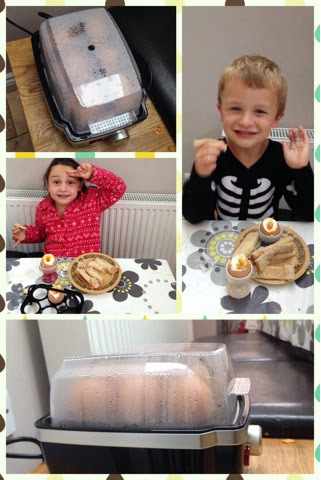 It's so cool and the kids love it, see eggs and soldiers are their favourite breakfast and egg is a real go to item in our house. They are quick and easy, versatile and nutritious and with an average of only 70 calories in an egg I can enjoy them on my eating plan with no worry. We make omelettes, scrambled, poached (my personal favourite), frittata and egg fried rice and of course use plenty for baking. So here's my egg boiler in action, as you see it's really easy, pop in the eggs, turn the dial and wait for the beep! And having such an easy method of boiling eggs means Termite can have her favourite egg in a cup. This is a Daddy recipe from his childhood. 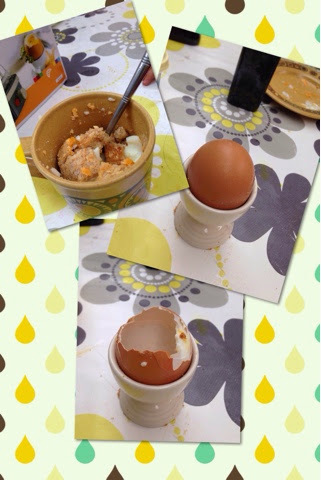 If he was feeling under the weather Grandma Jenny would make him a soft boiled egg and the take it from its shell and mash it in a cup with pieces of butter bread, it always made him feel better and its now Termites favourite way to eat egg. And like all children, for them the best part of soft boiled eggs? 'Tricky Eggs 'Pretending to Daddy that you are giving him an egg (which is actually the empty shell) then he gets a real shock when he cracks it!.